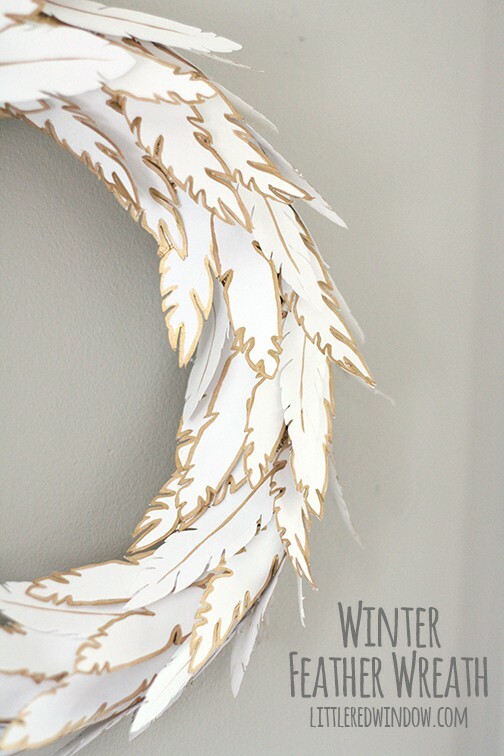 Make your own Wintry Paper Feather Wreath, it’s fluffly, sparkly, gorgeous and best of all, easy! A few years ago, I made my Fluffy Pom Pom Snowflake Wreath and from that moment on I was a little bit obsessed with white and metallic holiday decor. It’s pretty and sophisticated and kind of neutral. I also love decorations that aren’t necessarily just for Christmas. Maybe you don’t celebrate Christmas. Or maybe you want something that can stay up well past New Year’s so wintry decorations are perfect! Bonus, this project is SO easy. (And don’t worry, I included a supply in case you don’t own a cutting machine. I’ve got you covered!) But really, this project would make such a fun project for a friends’ craft night! Anyway, I am so happy with how this wreath turned out! It’s the perfect mix of glam, sophistication and just enough sparkle! 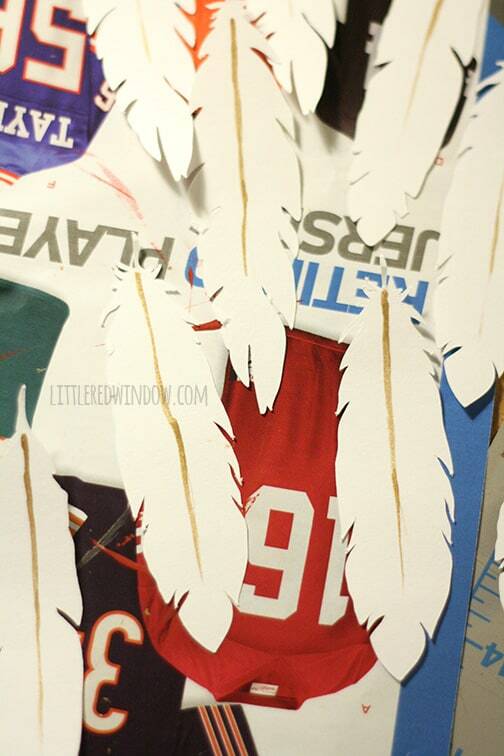 If you don’t have a cutting machine, here are some pre-cut paper feathers! 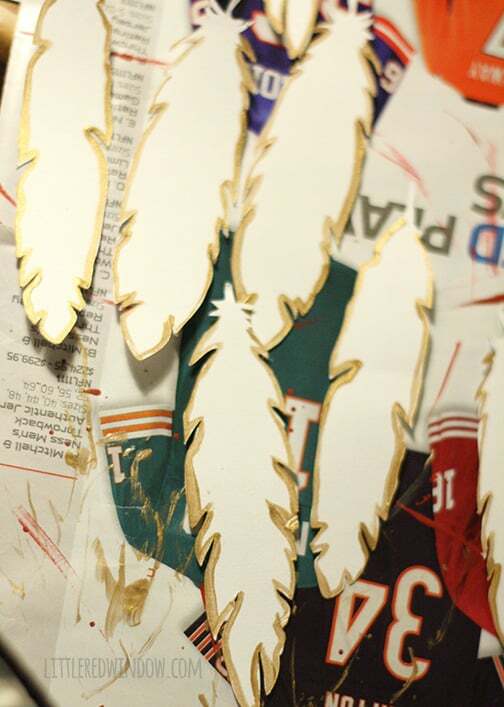 Next I cut out many feather shapes with my silhouette cameo. 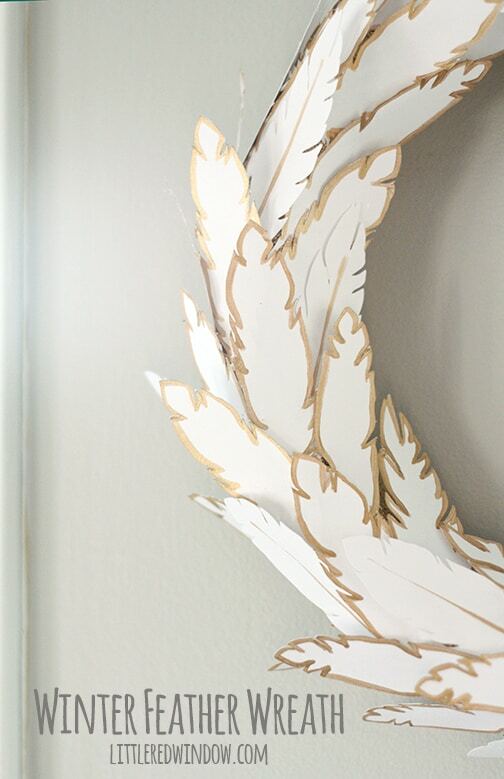 Once I had a pile of white paper feathers, I used a small paintbrush to add some gold details. 3. 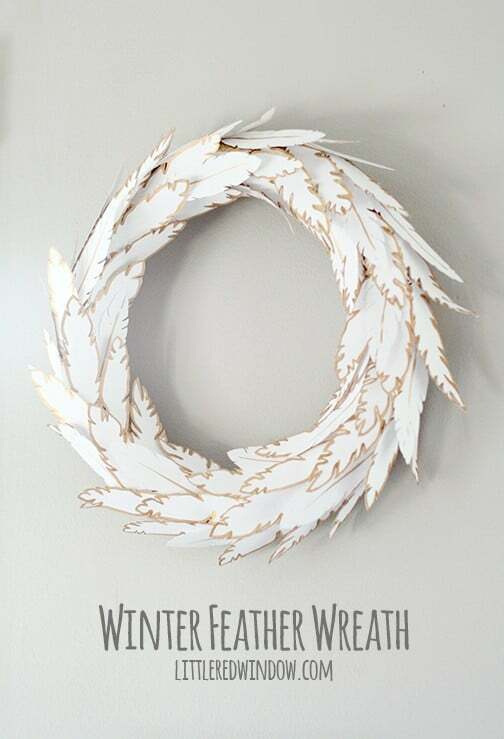 When the paint was dry I simply hot glued the feathers to the wreath form in a clockwise direction. When it was done I LOVED it! It’s modern, sparkly, glam and sophisticated! 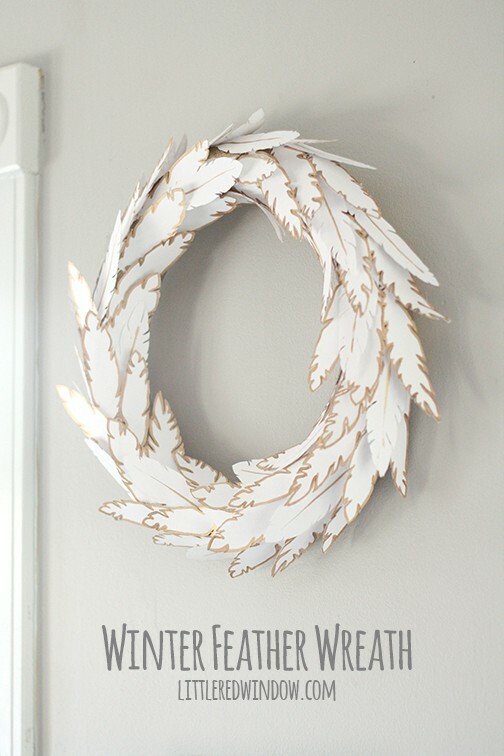 Hot glue feathers fo wreath form in a clockwise direction. Gorgeous! Love the simple elegance of the repeated pattern and the colors. Pinning! I love how simple and modern this is!! My cutter would be my hand so this’ll have to be a project for next year, pinning it for then 🙂 And I’ll be featuring it tonight on On Display Thursday, thanks so much for sharing it!! 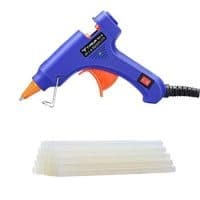 maybe you could find a feather shaped paper punch? Thanks for the feature and for stopping by, Emily! This turned out lovely! What a creative idea! This came out beautiful! Thanks for posting. Hello from Busy Monday. WOW! this is so gorgeous!! 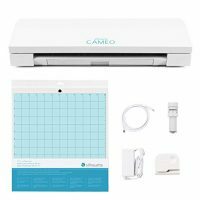 I just got a silhouette, so I’m learning, but I LOVE the idea of cutting out something like this!! WOW! thanks for linking up to the Create Link Inspire party! Absolutely gorgeous! 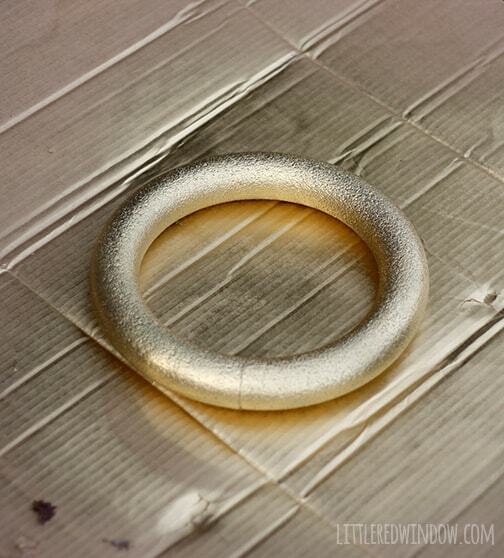 I love the added gold paint..it really makes this wreath amazing. Love your wreath and how simple, pretty and easy it looks to make! I love the cameo Silhouette! 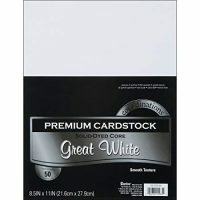 We sell them at Paper Source where I work and I am getting one for Christmas!!!! Your wreath is gorgeous!!! So beautiful and simple. I think I might have to find time for this project! 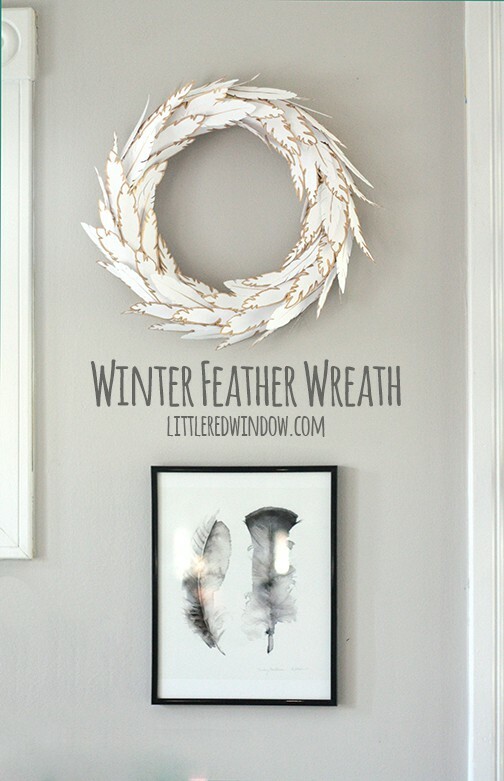 Your feather wreath is so beautiful in it’s simplicity. The white and gold are timeless. How many feathers did you cut with your machine? I’d have to hand cut them all but guess it’ll have to wait til after our craft show on 12/13. Just no time to cut out all those leaves then do some finessing with paint. 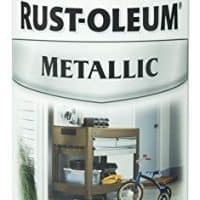 Wish there was as think it would be a great product for craft show .Maybe a gift to make for somebody after show. I love white and gold combo. So clean and glitzy. Keeping to simplistic seems to be my motto this year. WIll be pinning this so I can make it after show and give as well as enjoy myself. wish I had one of those nice fancy machines but don’t have time to learn how to use one. Love your wreath so much. Great job and inspiration. 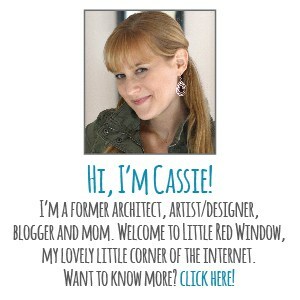 SO gorgeous Cassie!!! LOVE the gold touches!